Disruption, Innovation, Connectivity – European power in a global world. We asked: What is the future of a European technology corporation in one of the fiercest, global industries? 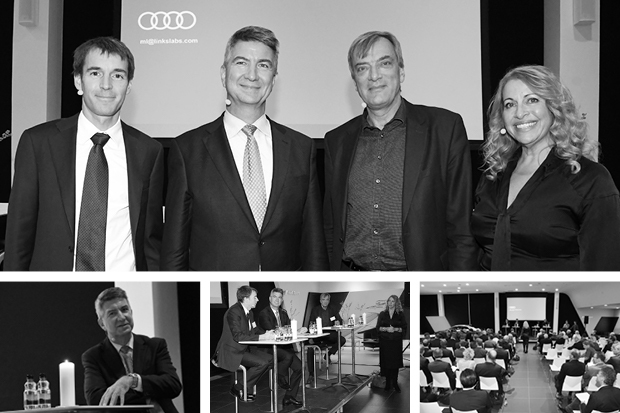 LinKS alumni and friends joined an executive strategic knowledge ride with leading European corporate Audi at Audi Gladsaxe in Søborg on 5 December 2016. The center of rotation and acceleration was our LinKS Alumni and our special top executive guest, Ulrich Eichhorn, CTO from corporate VW, owner of Audi. The LinKS Connect started with the guests having the opportunity to test drive Audi models which was followed by a session of insight in global technology business, E-mobility and governing on a global scale. “Is it not quite risky for the Volkswagen group to downplay the role of sharing and multi-format transportation solutions across vehicles (trains, buses, ferries)? Will a total societal solution not be necessary, especially as Africa and Asia develop further? What are the disadvantages of being an incumbent in the car industry, and what do you fear the most from non-industry challengers such as Tesla, Google and Apple? Which new capabilities and profiles would you want to see on the non-exec board of the Volkswagen group in the future in order to support AND challenge management (the ‘Vorstand’)? How to balance the need for acceptance of mistakes (which are needed for innovation and progress) and ‘failing fast’ with the need to avoid fatal accidents (when implementing driverless cars etc.) and joint solutions for society (not just individual companies)? What are the strategy choices made by the Volkswagen group, which will sustain its leadership position of the mobility industry?